The past several weeks have been full to the brim, but I’m grateful that I was able to squeeze a few books into the cracks. This month is a little leaner than last month , but there are definitely some keepers in here. Happy reading! Jon and I have been spending an evening each week having “nanochurch” — a small group that consists of only our family members — in a bold attempt to continue our Christian education while eliminating the exhaustion factor that comes with leaving the house and managing childcare for a traditional small group. 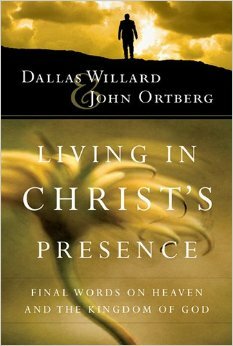 Dallas Willard and John Ortberg team together to illuminate profound truths about the spiritual life — the nature of our bodies, the easy yoke of Christ, and the importance of slowing down, paying attention, and listening. Dallas Willard drops down mind-blowing spiritual wisdom every few pages: “You must arrange your life so that you are experiencing deep contentment, joy, and confidence in your everyday life with God.” We really benefited from reading along while watching the accompanying videos of these conference presentations. The book is essentially a transcript of the videos, and slowing down with Dallas’ presentation makes it all the richer. The girls even enjoyed dipping in with us while taking a break from their favorite nanochurch activity: a dance party to the soundtrack of The Sound of Music. I finally plowed through this budgeting book (which has languished on my shelf for too long), and I’m glad I did. I had expected to come away feeling guilty (since I know our personal budget needs some work), but instead experienced renewed energy on the topic. Scandrette presents his ideas about the intentional stewardship of time and money with a delightfully experimental tone, encouraging the reader to play and try things out, but never ladling on the “shoulds” that often come with discussions about money. Readers of time-management books will find a lot of his goal-setting practices already familiar, but it’s worth skimming through to hear the personal stories and ponder the reflection questions. This book is really meant to be worked through with a group, but even on my own, I walked away with fresh inspiration, some new ideas, and a resolve to set a date with Jon so we can take a crack at this budgeting software we bought months ago. I’ve been doing some writing of my own on the story of Mary and Martha (Luke 10:38-42), so I knew I needed to take a look at this inspirational treatment of the story. I’ve got to be honest, I’m not crazy about this style of devotional book, filled overmuch (in my opinion) with Guidepost-style inspirational stories and bullet points that all begin with the same letter. However, I’ve got to hand it to Joanne Weaver for bringing out some insightful truths about Mary and Martha, addressing issues of busyness, worship, and life balance that most of us struggle with. I’m glad this book exists, and I’m glad I didn’t have to write it. I do love Agatha Christie, but this novel did not push the same buttons for me that a good Hercule Poirot or Miss Marple mystery does. Still, I got sucked in after the first chapter and had to find out — whodunnit? I don’t know why I was surprised by the antiquated portrait of adoption this 1958 novel presents (Is there an inevitable sense distance and animosity between parent and child? I don’t really think so), but later it became clear that this family was completely dysfunctional, adoption or no. I thought I knew who murdered her all along, but Agatha pulled one over on me, as usual. Had to stay up way past my bedtime to finish it. What a perfectly beautiful story, worth reading multiple times (round two for the children, beyond count for Mama). 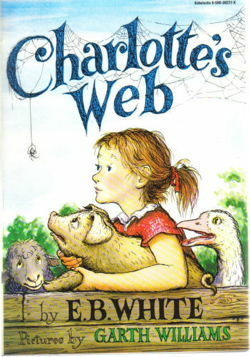 Charlotte and Wilbur’s mutual admiration and selfless giving teaches us all about what it means to be a true friend. I was tickled upon this reading by Charlotte’s delightfully clear way of expressing herself. Her brutal evaluation of Uncle, the pig-competition at the county fair, is not to be missed: “One thing is certain, he has a most unattractive personality. He is too familiar, too noisy, and he cracks weak jokes. Also, he’s not anywhere near as clean as you are, nor as pleasant. I took quite a dislike to him in our brief interview.” We finished the book just in time to see a live production of it at Northwestern University, creatively staged with a gray-clad human Charlotte directing a puppet spider. We’re serious Tomie dePaola fans over here, so when I saw (while browsing through the recently returned cart at the library) this first book in a series of autobiographical chapter books he wrote, I snatched it up. It was just the thing we needed while Lucy worked through her stomach bug last week — a sweet, engaging collection of dePaola’s family lore, complete with tales about accidental laxative ingestion and the indignant response of five-year-old Tomie to his first viewing of Disney’s Snow White (“Where’re the red-hot iron shoes that they put on the Evil Queen so she dances herself to death?”). You can almost hear his family telling these stories around the pasta-laden dinner table. Yes, I know — I sometimes have two Agatha Christie novels going at once (one on the bedside table, one audiobook). It can get a little confusing, but it’s good for strengthening my “little gray cells.” Hugh Fraser’s Poirot is always one of my favorite renderings (although David Suchet tops the list). Don’t miss the amusing parody of a mystery writer found in Mr. Clancy — love Agatha Christie’s self-depracting humor.